Hugh Masekela (4 April 1939 – 23 January 2018) was a South African jazz musician, trumpeter, flugelhornist, cornetist, composer and singer. 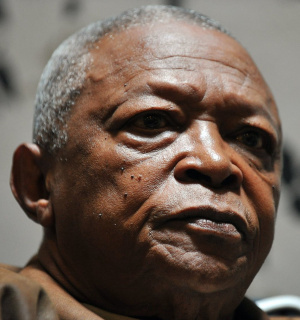 He gained widespread international success and fame for his jazz compositions and for writing well-known anti-apartheid songs such as "Soweto Blues" and "Bring Him Back Home". His version of "Grazing in the Grass" reached number one on the Billboard Hot 100 chart in 1968 in the United Sates of America - this was at the peak of the careers of the The Beatles, Simon & Garfunkel, Marvin Gaye, Diana Ross & the Supremes and Otis Redding who had died in the airplane crash just six months earlier. Hugh Masekela had one of the most distinguished music careers lasting 59 years and earning 3 Grammy Award nominations along the way. This page was last edited on 13 November 2018, at 20:16.